Once again, the Dutch music scene shows that it cranks out top notch female-fronted heavy music; however, Delain, Epica, Within Temptation, and The Gathering aren’t the only ones in town. My first encounter with Illumion was a pleasing one as The Waves proved to be an impressive album which represents a stunning and fresh take on female goth metal meets prog rock. Perhaps what sets Illumion apart from other female fronted rock bands is that the band always seems to present its own style as opposed to just another take on a familiar genre. TheWaves gives us a full on journey with lots of influences ranging from Asian folk, jazz, and flamenco, to symphonic prog and heavy metal. The good thing is that almost nothing here feels like a rip-off and nothing feels overdone. “Ember” starts off with some serious electronic meets heavy guitars groove and combines with vocals that give sort of a Renaissance feel with a gothic touch; the key word here is catchy. Both “A Tale of Kings” and “Canvas” show tasteful jazz influences while maintaining a heavy edge, or in the case of the latter, moments that are so dark they evoke funereal moments of nihilistic despair, which is particularly interesting because the song has moments that are quite bright, even bouncing, I would say. “Adamantine” caught my attention with it’s flamenco influences, while “Sorrow’s End” is a fulfilling ballad with mystical qualities that combines guitar arpeggiation with synth bass and sax soloing in a way that recalls the mood plainly put forth by the title. 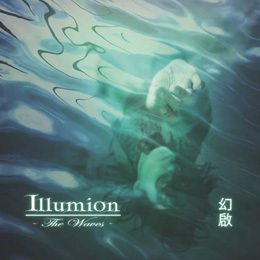 If you are into the female-fronted goth metal thing but want something that doesn’t sound like the same rehashed thing, be sure to check out Illumion.